Every time John and I buy a head of celery for a recipe, inevitably there are a few sad stalks unused and left to wilt in the crisper. But with this veggie-infused gimlet, there will be no sad celery in our fridge! 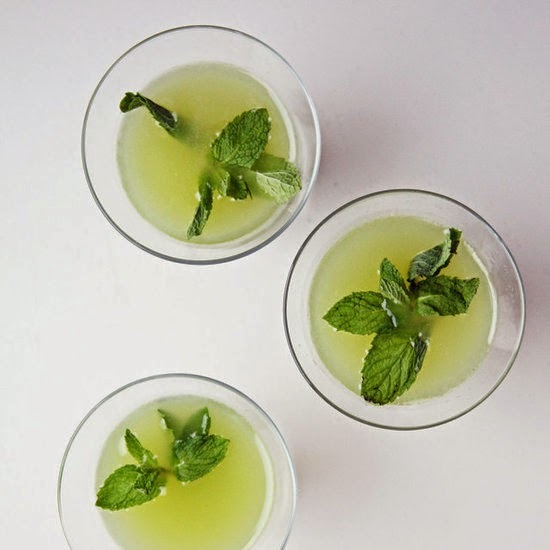 Combine lime juice, syrup and mint leaves in a mixing glass; muddle gently. Add gin, celery juice and ice; shake well. Double strain into a chilled cocktail glass and garnish with a freshly slapped sprig of mint. Notes: The star of this cocktail is fresh celery juice; run a stalk through your juicer, pulverize it in your blender and then strain the solids with a cheesecloth, or pick up a few ounces at your local juice joint. John recommends playing off celery's herbal notes with a complimentary London Dry gin like Beefeater, or using a more neutral gin like our old favorite, Plymouth. Cocktail by Daniel Hyatt for The Alembic, image by YumSugar. Celery juice is such an unexpected cocktail ingredient - sounds refreshing! Wow, what a fresh and interesting recipe. I never would have thought to add celery to a gimlet. Can't wait to try this one!